(The Root) — With all the talk about soaring gas prices, the last vehicle travelers are likely to consider when they're thinking about going on a road trip is a recreational vehicle. But Elbert Smith Sr., president of the National African-American RV'ers Association, says that travelers should think again because the vehicles are not the same as the Winnebagos of yesteryear — you know, those wending, side-winding gas-guzzlers. He says that today's RVs are sleek-bodied vehicles that can easily serve as home away from home. Some even have washers and dryers, four-door stainless steel refrigerators and freezers, flat-screen televisions, bed and baths and living quarters. "If you plan your trip wisely and maintain your vehicle properly, RV travel does not have to be hard on the wallet," Smith told The Root. "Travelers can also save on food and lodging. I'm not saying they are cheap, because they aren't, but they are a great way to travel." Smith suggests that travelers rent a few RVs before taking a long trip to determine what best suits them. After that, travelers who can afford it may get a yen to own one of their own, he says. RVs come in a variety of shapes and sizes. Travel trailers, or campers, which can be hitched to the back of a vehicle, start at about $20,000, and prices can go as high as $850,000 for MOST Mobile Special's Futuria Sports+Spa, which boasts a heated spa tub sunken in the "rooftop viewing area." 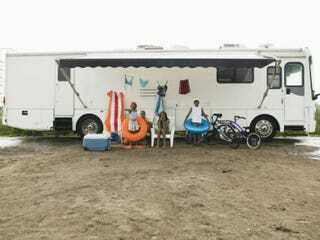 Smith, 68, of Dallas, who retired two years ago from his job as a heating, ventilation and air-conditioning supervisor, talks to The Root about black RVers and NAARVA. The lifelong camper, who owns a Fleetwood Expedition, calls RV travel "roughing it easy." The Root: What is the history of NAARVA? Elbert Smith Sr.: It was formed 20 years ago by Norman Ellis in Ohio. We started hosting annual national rallies in the summer as a way to bring families together. My first rally was in Buena Vista, N.J. But things seem to be picking up. This year our rally was July 22-29 in Marion, N.C., and we drew about 600 coaches. We are trying to recruit more young people. NAARVA is one of the best-kept secrets in the country. TR: Are there many African-American RV owners? What's the average age and occupation? ES: We have about 800 paying members across the nation. We range in age from late 50s to early 60s. We have members of all stripes, including blue-collar workers, lawyers, educators and a Tuskegee Airman. Everyone is welcome. TR: What is one of your fondest road trips? ES: I bought a cab-over class C camper in the late 1980s — you know, the kind that you hitch to your car — when my son went to Kansas State University. We used to go there a couple of times a year and park in front of the football stadium during the season and stay in it instead of a hotel. It was great. It was a house on wheels because we had everything in there but the kitchen sink. The kids thought we were big dogs. My son used to walk around with his chest poked out. They didn't see many of us black folks in RVs or campers. I would barbecue a brisket, and my wife would bake cakes. Because of those times, I unofficially have about 15 kids. They call me Pops. I just saw one of them when I rolled through Atlanta. Anytime any of them are in the city, they will come by the house to holler at us. TR: What are some pitfalls of traveling by RV? ES: I'm an avid camper, so you have no complaints from me. All my wife and I have to do is look at each other and say, "let's" and the other says, "go." We've seen all but four of the states — Vermont, New Hampshire, Maine and Delaware — but you could never get me to live in an RV full time. I like having a home to come back to after being on the road. I like walking out the door and looking at the grass and turning around and walking back in the house. I like having a place to call home. Lynette Holloway is The Root's Midwest bureau chief.